What Presidents will we forget – or our grandkids never hear of at all? In AAAS’ Science, Washington University of St. Louis scholars Henry L. Roediger III and K. Andrew DeSoto offer one analysis. But I’m guessing they’re wrong. Their idea is based on the idea that people are good at remembering the beginning of lists, and the end, but only remarkable items along the middle of the list. 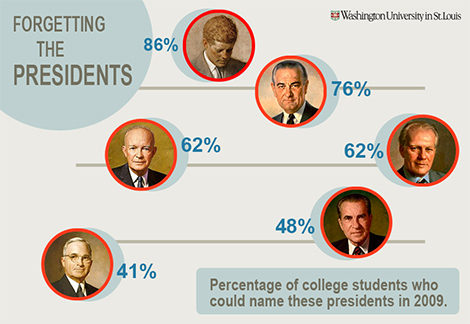 Using data collected from surveys of undergrads in 1974, 1991, 2009, and an adult survey in 2014, they found that Washington, Lincoln, and recent presidents are recalled, but those more than a couple of generations past are forgotten. But there are a number of advantages that recent and all future presidents will have over McKinley and Fillmore: video, a strong executive branch, and global authority. Washington was first and is iconic. Lincoln “saved the Union” and “freed the slaves” (critics of these phrases we’ll leave for another time). Washington and Lincoln were critically important historical figures, objects of study and admiration worthy of giant memorials and federal holidays. They have been recreated so often, from Chautauquas to school plays to mattress commercials, that we have “living” images of them. This “living image” is something that Polk and Jackson and others don’t have. But every President from now on (indeed, from FDR), does. We need only one “hook” to place them in their historical context with their historical legacy. 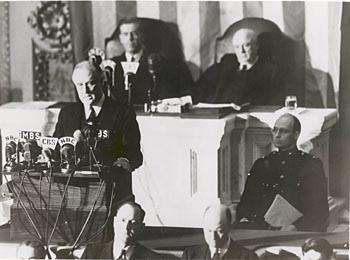 FDR will remain a permanent fixture with his New Deal’s “the only thing we have to fear, is fear itself” and World War II’s “December 7th, 1941, a date which will live in infamy.” John F. Kennedy will live on with the distinctive accent in his immortal call to “ask not what your country can do for you, but what you can do for your country.” Ronald Reagan’s challenge to the Soviet premier, “Mr. Gorbachev, tear down this wall!” highlights the coming end of the Cold War. The second advantage that recent and future presidents have is that the Office of the Presidency is greater, relative to the Congress, than it was in the 19th century. Senators Calhoun, Clay, Webster, and Seward, and House members like Thaddeus Stevens and Williams Jennings Bryan, were as large or larger than anyone but Lincoln. Theodore Roosevelt, Woodrow Wilson, and FDR began the 20th century ascendance of the White House as the dominant political force, concurrent with the beginning of the film era and the rise of American power. It is this rise of American power that gives recent and future presidents a third advantage in being remembered. With “leader of the free world” status, (whatever that means today, and with apologies to E.F. Hutton), when the President of the United States speaks, people listen. For more than 70 years, and for at least the near future, U.S. Presidents are global news. What they do is important, and it is noticed. From newspapers to satellite television to social media, the words and deeds of U.S. Presidents matter. This is related to the previous items: the ubiquity of presidential video and the centrality of the presidency as the global representative of the United States. Together, video clips, a shift to executive authority, and the global leadership role of the United States (and therefore of the President), might change how well Presidents are remembered in the future. Yale’s class of 2060 might not connect Harry Truman to Hiroshima or Jimmy Carter to malaise, but they should remember many more presidents of the video and superpower eras than today’s students remember from the 19th century.